A state bill targeted at helping country clubs in Arlington would cost the county more than $2 million in tax revenue, an internal county report says. HB 1204, patroned by Fairfax and Prince William County Del. Tim Hugo (R), passed the House of Delegates last week by a vote of 65-33-1. The bill would “reserve to the Commonwealth the power to classify golf courses as land dedicated to open space for assessment and tax purposes,” according to an internal Arlington County fact sheet. Requires the assessing official in any county that experienced at least a 14% increase in population from 2010 to 2016 to specially and separately assess real property that is devoted to open space and contains at least five acres based on the actual physical use of the property, if requested to do so by the owner. The measure is effective for taxable years beginning on or after January 1, 2018. The bill only would apply to Arlington and Loudoun counties, we’re told, and it would primarily affect the tax assessments of two entities: Army Navy Country Club and Washington Golf and Country Club, both in Arlington. The country clubs are currently suing the county, challenging their respective assessments. Arlington assesses each based in part on their potential value as developable land, meaning that the assessments — and yearly tax bills — are much higher than if the clubs were assessed only on the basis of their current use. 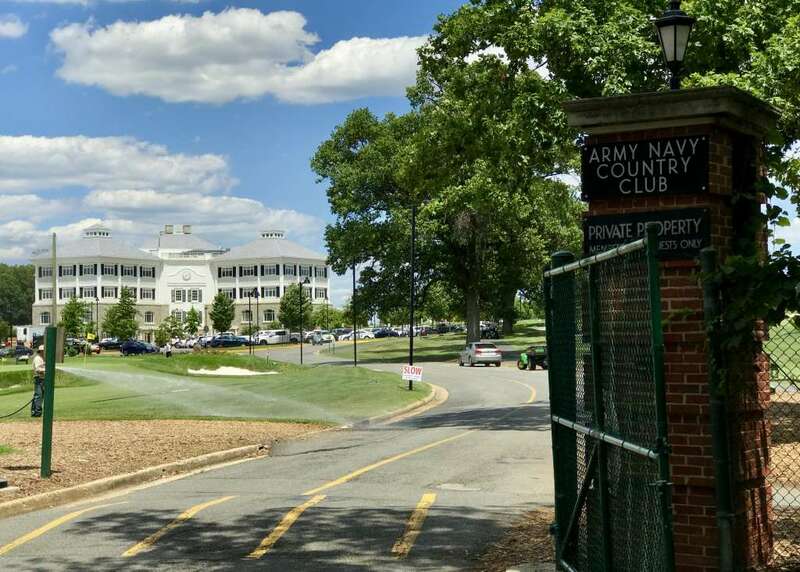 Army Navy Country Club, near Pentagon City, was assessed at $149 million this year, and paid $1.5 million in taxes last year, according to county records. Washington Golf and Country Club, located along N. Glebe Road near Marymount University, is assessed at $79 million and paid about $839,000 in taxes last year. The internal county report says that the country clubs are both currently assessed as “large acreage parcels,” valued at about $12 per square foot. By comparison, some residential property near WGCC is assessed at nearly $100 per square foot. Should the legislation pass, the assessed value of the clubs is expected to drop to around $0.50 per square foot, costing the county nearly $2.4 million. The Virginia Municipal League is opposing Hugo’s bill, which is currently being considered by the state Senate. In an email, the organization urged localities to take action. The state Senate’s Finance Committee is expected to discuss the legislation at a hearing Tuesday morning. At its meeting Saturday, two County Board members supported advertising a higher property tax rate, based on the risk of lost tax revenue from the bill. A majority of the Board, however, voted against raising the rate.